More possibilities: career prospects at Melitta. There are many possibilities to forge a successful career at Melitta. After all, as a top employer, the successful family-owned company offers a variety of attractive opportunities for advancement, in addition to a pleasant working environment. 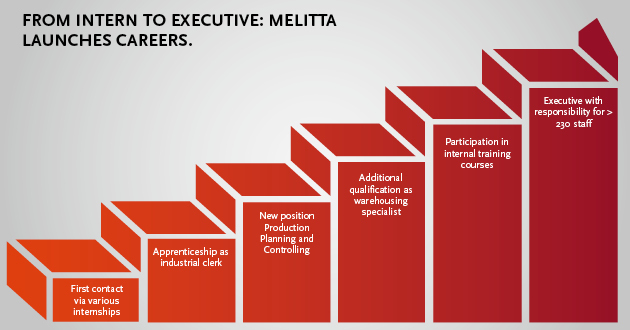 Throughout their careers at Melitta, employees not only benefit from flat hierarchies, short decision-making paths, a high degree of team orientation, and an international environment, but above all from the advantage of being able to act in a strongly entrepreneurial manner – enabling them to contribute their own strengths and interests. Melitta is equally passionate about providing support for trainees, apprentices or students and promoting their career prospects. For at the company’s headquarters in Minden, top management knows only too well that careers forged within the Group pay off in the long term. A sustainable concept: successful careers at Melitta. From marketing and sales, to research and development, to service and production: the career opportunities at Melitta are as varied and diverse as the different fields of work and professions. The company is committed to empowering its employees – and giving them the opportunity to get involved in interesting projects at an early stage. And not without reason: only those who achieve their own goals by pursuing their own strategy, can successfully drive their careers at Melitta. Equally, nothing is left to chance when it comes to training and people development – opening up new career opportunities for Melitta’s employees. For example, tailored development programs are just as much a part of the corporate culture as annual performance reviews with individual feedback on possible career prospects. The overriding objective: to retain employees for as long as possible. From intern to executive: Melitta launchers careers. Speaking in leadership roles: like Michael Weber, all senior executives and middle managers at Melitta receive active career support. This is based on a competency model that enables managers to fully exploit their potential – and to further refine and expand their skills year after year with the aid of leadership performance reviews. The measures are rounded off, for example, by individual coaching sessions or multilingual management seminars. Such optimal conditions make it easy to lay the foundation for a successful career. For example, from apprentice to Key Account Manager. 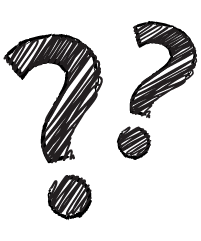 Just one question remains: When are you going to launch your career with Melitta? Apprentices and students are always regarded as fully-fledged team members and actively involved in the work at hand. Mutual respect among colleagues is encouraged and young staff are motivated to launch their careers with Melitta right from the start. Getting to know every department is an integral part of apprenticeships at Melitta. This ensures that everyone gets a good insight into the different work areas. In addition, workshops in which members share knowledge of their work and new expertise is imparted increase the career opportunities. Some aspects of work are routine, as many tasks can be completed in a similar way every day. Melitta provides additional career opportunities by involving staff in interesting projects, in which they learn new things and can contribute their unique strengths and existing knowledge. Remuneration at Melitta is in line with industry standards. In addition, the company pays holiday and Christmas bonuses and offers extensive social benefits. Overtime accounts can be reduced by taking days off. Thanks to flat hierarchies, even apprentices often have contact with top management. A successful career at Melitta is really not that difficult to achieve: be part of the team, have ideas, and implement them. That’s how to work successfully. Melitta regards honors such as the Top Employer award as an incentive to continue its efforts to inspire its employees with challenging tasks, as well as with an outstanding work climate and appreciation.